Welcome to The Doggy Minder website. My name is Lorraine Strachan. I have ran my dog walking business since 2012. 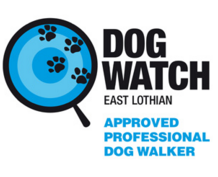 I provide a dog walking service (Mon-Fri) in East Lothian for Port Seton, Longniddry, Tranent and Prestonpans. I do two group walks per day with a maximum of 5 dogs on each walk. The cost is £10 per dog which includes pick up and drop off, a full 1 hour walk and ensuring your dog has water and has been dried if needed on return. You will be able to keep track of how much fun your dog and their new friends have with the regular facebook photos that we post. New doggies will be lead walked until we get to know each other and establish a good recall - I always have lots of treats to hand! A weeks trial will be offered to make sure all the doggies get along together and you feel happy & secure. "Excellent care and service from the doggy minder! Lorraine walks Lola 3 days a week and Lola loves going on her adventures with Lorraine, lots of feedback and photos too  Highly recommended"
"There is nobody better. Buckley approves. 5 paws!" See feedback & reviews for full details.